Warren's Nick Hussey and his Erie Steelheads teammates had a busy weekend at the Mountaineer Cup Championship. 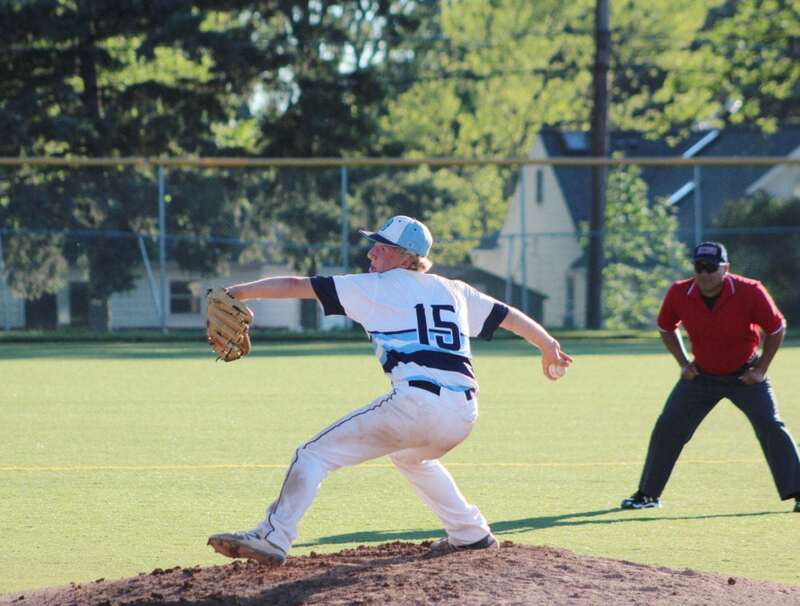 LEWIS CENTER, OH – Aidan Kelly pitched seven strong innings, but in the he won the game at the plate. With the bases loaded and two outs in the bottom of the eighth, the Cathedral Prep product drew a 5-pitch walk to force home Mason Bender (Fairview) for the winning run in the Erie Steelheads’ 4-3 comeback win over the Manchester A’s (North Canton, Ohio) in the first game of pool play at the Buckeye Elite Showcase 16U Tournament at Olentangy Orange High School on Thursday. Warren’s Nick Hussey got the win in relief, pitching a scoreless top of the eighth with a strikeout and a walk. With one out in the bottom of the inning, Bender and Warren’s Ryan Rafalski drew walks and, after a strikeout of Cody Smith by Robbie Akers, Cam Williamson (Harbor Creek) was hit by a pitch, bringing Kelly to the plate. Kelly allowed seven hits and walked three without a strikeout, but he did keep the A’s hitters off balance. 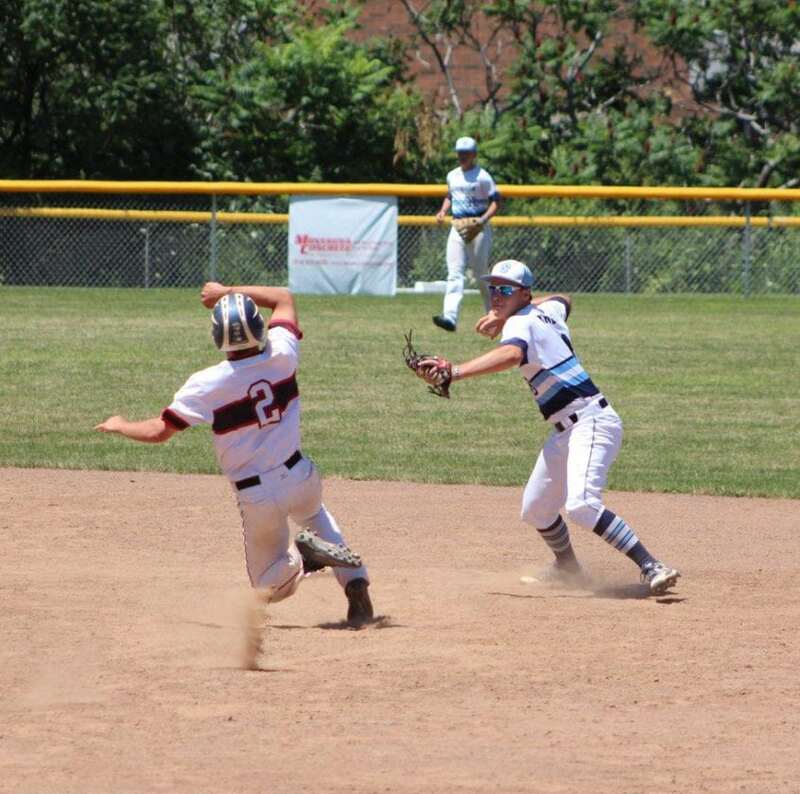 Warren’s Ryan Rafalski (right) had a strong game for the Erie Steelheads in their 4-3 win over the Manchester A’s in the opening game in pool play in the Buckeye Elite 16U Showcase Tournament on Thursday. The A’s struck for a pair of unearned runs in the first inning and starting pitcher , 6-3 lefty Cooper Davies (Chippewa H.S. ), didn’t allow a hit in the first three innings. That changed in the fourth, as Warren’s Mitch Grosch drew a leadoff walk, just the second baserunner of the game following a free pass to Rafalski in the second inning. Matt Shepard (McDowell) singled and Grosch advanced to third and ultimately scored on a sac fly by Bender to get the Steelheads on the board. The Steelheads, who are now 18-4, tied the game in the fifth, as Kelly singled with one out and Hussey was brought in as a courtesy runner. Hussey advanced to second on a passed ball and scored on Jared Bielanin’s (McDowell) single. The A’s, who boast a record of 28-6 this summer, re-took the lead in the top of the sixth on Shea Simmer’s (Manchester H.S) 2-out RBI single. The Steelheads had a little 2-out magic of their own in the bottom of the sixth to tie the game. Cody Smith’s RBI single brought in Mason Bender, who drew a 1-out walk. For the Warren products, Grosch was 0-for-3 with a walk and a run scored, while Rafalski was 0-for-1, drawing three walks. Hussey, in addition to being the winning pitcher, also scored a run while courtesy running for Kelly. In addition to their offensive prowess, both Rafalski and Grosch have been playing outstanding defense at shortstop and third base respectively. Rafalski made a great play in the fourth inning, going deep in the hole, backhanding it and firing a strike to first, saving a run in the process. 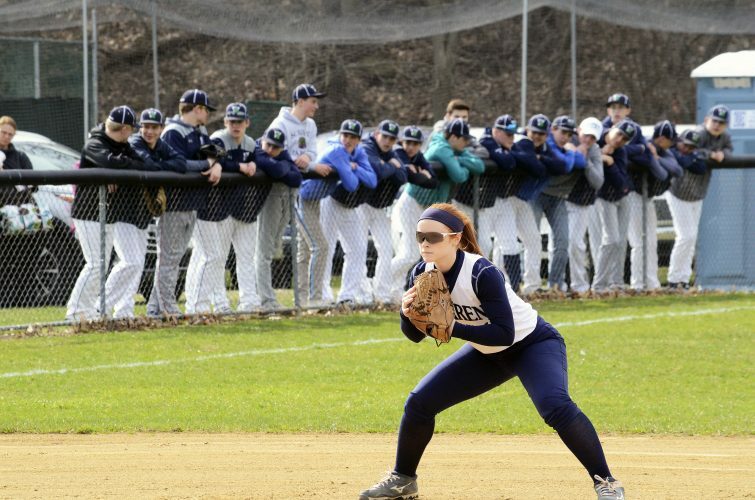 Kelly had two hits, an RBI and a walk, while Shepard had two hits and Bender two walks, two runs scored and an RBI. Simmer finished with three hits for the A’s. Both teams are back at it today in Pool F action. The Steelheads get under way bright and early at 8 a.m. against the Pittsburgh Spikes, followed by a 10:30 a.m. contest against the Columbus Cobras. Both games are back at Olentangy Orange H.S. The Cobras (17-9-2) edged the Spikes 9-8 on Thursday. 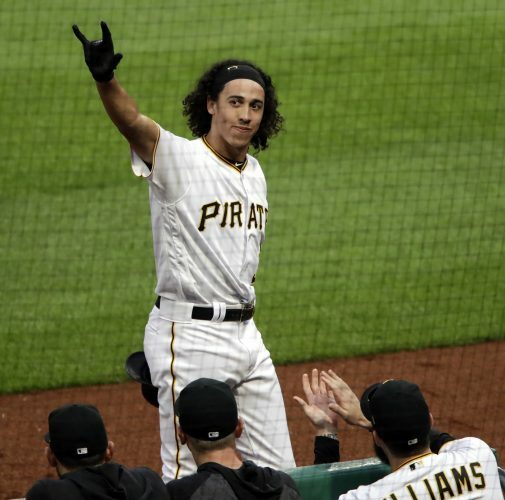 PITTSBURGH, Pa. – Warren’s Aidan Morrison (catcher) drew a pair of walks, scored a run and stole a base, while Austyn Cummings (DH) went 1-for-2 with an RBI and a run scored as the Mid-Atlantic Red Sox opened the Pastime Tournament at the University of Pittsburgh with a 9-0 win over the Toronto Mets Blue on Thursday. Uncommited prospect Tyler Russo tossed a five inning shutout, striking out seven, allowing four hits and walking two. The Red Sox, now 14-5-2 this summer, did most of their damage in the fourth inning, scoring seven runs. Jack Ryan (Walt Whitman) was 2-for-2 with an RBI and a run scored, while Tyler Martinez (Gilman) was 2-for-2 with an RBI and two runs scored. The Red Sox play two games on Friday, beginning at 1 p.m. against the Lake Erie Warhawks at Moon Area High School, followed by a 6 p.m. contest against West Hills baseball back on the Pitt campus at 6 p.m.